If you are starting out in Business, you have several decisions to make. A key decision is to decide which form of business to use. 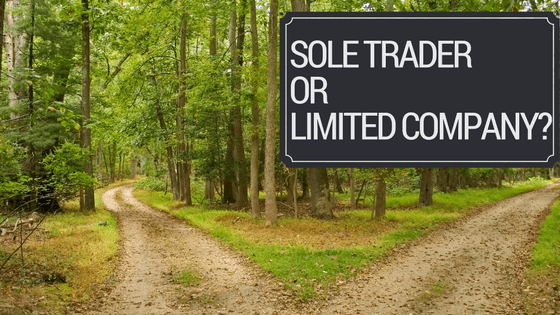 Will you trade as a sole trader or will you trade through a company? You may not fully understand the difference between the two forms of business or the consequences of choosing one option over the other. This can make the decision difficult for you. Over the years while practising as an accountant, I have been asked about this issue many times. Here is the advice that I give to my clients. A sole trader means that you are trading as an individual i.e. yourself. A company is a separate legal entity that is created for the purpose of carrying on an activity usually a trade. In law, a company is a legal person and is separate from the owner(s). This means that a company can enter into contracts and can sue or be sued. As a sole trader, when you carry on your trade the other person is trading with you as an individual. If the business goes bust, you will be liable for the full debts of the business. As a company, you, and possibly others, will own shares in a company which carries on the trade. This company can, and usually does, have limited liability so your personal liability is limited to the amount you invested in in shares of the company. If the company goes bust, it will be liable for the full debts that is has and if the company cannot pay those debts the debtors cannot follow you for any more than you invested unless you have given personal guarantees over the debt of the company. A sole trader will have to register as a trader with the Revenue Commissioners and will have to file an annual income tax return. If the sales exceed certain limits, you will have to register for VAT. If you have employees, you will have to register as an employer for PAYE. There is more detail on VAT in this blog post What do you need to know about VAT. A company will have to register with the Companies Registrations Office (CRO). The company will also have to register for taxes with the Revenue Commissioners and will have to file an annual corporation tax return. If the sales exceed certain limits, the company will have to register for VAT. If the company has employees it will have to register as an employer for PAYE. If you have a company and are working in the business yourself, then you are an employee of the company. Do you intend to retain profits in the business? In the early stages of many businesses, the owner leaves profits in the business to build up working capital. Where the taxable profits are greater than what the owner plans to take out of the business by way of salary, then it’s usually better for the business to incorporate i.e. trade as a company. The reason for this is that a sole trader pays tax on all the profits, but a company owner will only pay income tax on salaries or dividends taken from the business. For a company, tax is levied at 12.5%, in most cases, on the taxable profits and the owner will also pay income tax on any salary or dividend taken from the company. In a situation then, where profits are retained in the business, the combined tax paid is usually lower when trading as a company and in that situation operating as a company may be best. Note, however, that if the company is a service company there may be a 15% surcharge on undistributed profits. This applies to accountants, architects, etc. However, there are other factors that should also be considered. Do you plan on investing in a pension? Tax Relief on pension contributions is more restricted for sole traders than for company directors. If an individual wants to maximise a pension fund then it may be best to trade as a limited company. What is your exit plan from the business? Generally speaking, having a company is better for transferring ownership to children as you can allocate shares to the children. In businesses where there is a risk to the owner from significant claims against the business, then Limited Liability companies are best. For example, if the liability for product failure would be high, then consider trading as a company. Are there any specific rules or restriction for your business sector? For some businesses, laws or regulations may not allow the business to be carried on by an incorporated entity. For example, it appears that while doctors can practice as unlimited liability companies, the GMS only awards contracts to individual doctors. Do you plan on investing in Property? In almost all cases, it is better to have investment property owned personally so as not to have a double tax charge. If an investment property is sold by an individual the individual will pay capital gains tax on any gain. If the investment property is sold by a company, the company will pay capital gains tax on any gain. However, if the owner wishes to take the gain out of the company then he/she will pay income tax on the salary or dividend. Some tax incentives require the business to be incorporated so if you plan on raising funds under the Employment and Investment Incentive Scheme (formerly known as BES) then you will have to have a company. There are more tax incentives for companies than for individuals. Certain companies are exempted from Corporation Tax and/or Capital Gains Tax in each of the first three years to the extent that their tax charge from qualifying trading activities does not exceed €40,000. More on this on the Revenue website here. There is marginal relief where the tax charge falls between €40,000 and €60,000. In other words, a company can generate up to €320,000 in taxable profits each year, at the current tax rate of 12.5%, for three years without paying any corporation tax. Conditions apply which seek to ensure that it is only new businesses that qualify rather than businesses being transferred from another Irish entity or businesses being moved to a limited company from a sole trader/ partnership. The information in this article is not intended to be a comprehensive overview of all the issues relating to deciding which form of business to use. This is presented as guidance to help you decide if you need more detailed advice. You should seek professional advice before making any significant decisions. If you have any questions, be sure to let me know by emailing me at jim (at) accountsplus (dot) ie. Common Problems when working with accountants Are your financial results different from what you expected?